Winter is a memorable time for photographers who enjoy the challenges and the rewards that come with photographing the season. Dedication comes to mind when we think of photographers who enjoy going on adventures in freezing temperatures to capture images in conditions that other photographers would not be willing to consider. This unique stand of trees is a perfect foreground against the colors of the Northern Lights, outside Kiruna, northern Sweden. A trip to the park in summer means hot weather, overcrowding and congestion. On the other hand, winter is the perfect time to try shooting some unique perspectives of your favorite places. The solitude and peacefulness of a winter scene allow us to see the landscape in a whole new light. What makes winter unique for the photographer is the chance to experience nature on a more intimate level, to think more deeply about what one is trying to capture and how one is going to relate this to the audience. Winter photography can be very rewarding if you’re prepared for the challenges of colder temperatures. There are a few simple tips that will make your winter adventures more enjoyable. Your clothing, protection for your camera equipment and a different approach to the picture-making process are equally crucial to the enjoyment of winter photography. Common among these elements is the notion of preparation for all winter conditions you may encounter. A lack of planning for winter photography can stop you from fully experiencing its beauty. When it comes to shooting in the winter, the weather can be very unpredictable. The best way to prepare is to expect anything—dressing appropriately for the situation is fundamental. When it comes to apparel, it is necessary to plan for weather that may change suddenly and significantly. 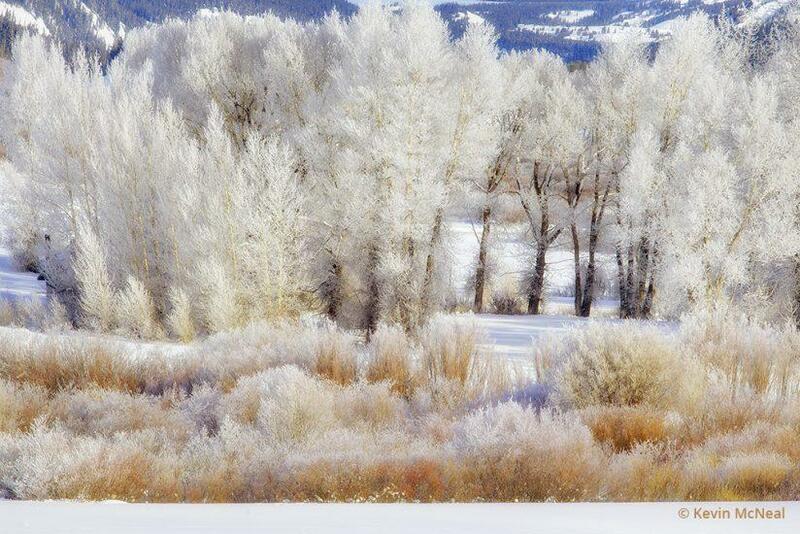 Hoar-frosted trees show off their winter coats during a very cold morning in Grand Teton National Park. Photography in colder temperatures causes your body temperature to shift dramatically between hot and cold, as it often means varying activity levels. Anticipating this, wear clothing that can be easily opened with zippers in specific areas of the body for fresh ventilation, and be careful not to wear too many layers that cause you to overheat. For a photographer who already carries heavy camera equipment, dressing in layers adds extra weight and is not ideal. The kind of clothing recommended is some form of loose-fitting, breathable jacket that’s suitably insulated for the expected conditions and that has zippers, allowing you to open and close it quickly, depending on your level of activity. It is also important to leave no area of the body exposed to the colder temperatures. Always wear a warm hat to avoid excessive heat loss through your head. Research shows that 70 percent of one’s body heat can be lost by not wearing a winter hat in colder climates. In addition to a warm hat, wear pants that are fully waterproof yet comfortable and flexible so as not to inhibit your movement if, for example, you want to kneel for a lower perspective on your subject. The ability to move around comfortably and stay dry is critical. Regarding footwear, boots need to be waterproof, insulated and tall enough around the ankles to prevent snow from creeping in. A pair of gaiters—water-resistant covers that go around your footgear from the ankle to below the knee—keep snow from getting inside your boots. 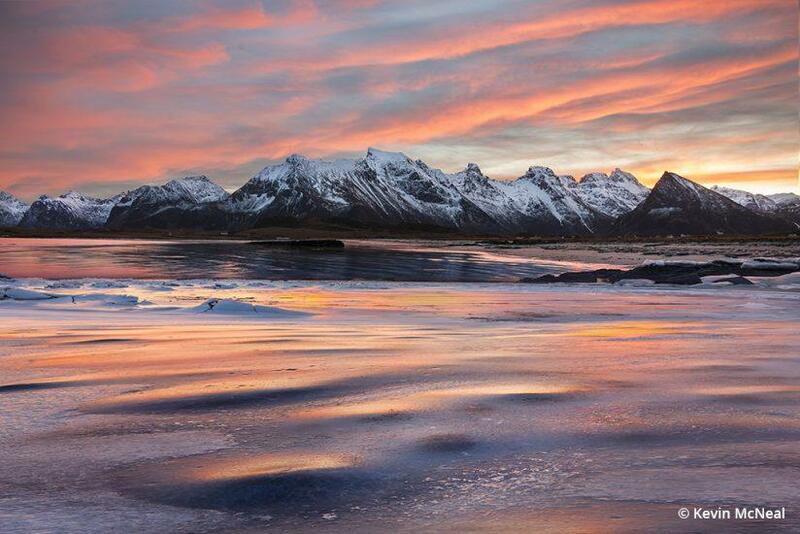 A fiery sunset reflects in the textures of a frozen lake in the Lofoten Islands of Norway. Colorful skies are a perfect complement to the white of winter. The one piece of equipment that photographers often wear incorrectly is gloves. You may be tempted to choose gloves that do not have fingertips, thinking that fingerless gloves will allow you to manipulate the camera controls more easily. The truth is that most winter conditions are cold enough that exposed fingers will hinder any refined control of the camera, thus making it more difficult to operate the camera properly. The better option is to wear gloves that have five-finger touchscreen capability. Make sure the gloves are both waterproof and windproof. When it comes to enjoying your time in winter, the right type of clothing can make all the difference between a good and bad day. Today’s cameras that are weather-sealed typically perform very well in cold temperatures, but there are a few important considerations to be aware of when preparing camera equipment for winter. Keeping your batteries warm is one. Depending on how cold the temperature is, battery life can be greatly reduced. Results vary depending on the temperature and camera model, but it is safe to assume that batteries might only last a few minutes in cold weather. I hold one of my hand warmers on the camera to keep the battery area warm. This action helps extend the life of the battery. I also carry backup batteries and keep them close to my body for extra heat—the batteries should be in a location as close to the body as possible. Throughout the day, switch out the cold batteries with the warm ones for longer shooting. Another common problem with camera equipment in winter is the condensation that occurs from changes in the environment. Frigid air has very little water vapor and is dry. When a camera comes from a cold outside environment to a warmer and more humid environment like a heated vehicle, water vapor can condense on the outside and inside of the camera. Water inside the camera can cause the electrical components to malfunction or even be permanently damaged. To avoid this, bring a large Ziploc bag and seal the camera inside it before moving from a colder to a warmer environment, and leave it there until the temperature inside the bag is roughly the same as room temperature. Winter also offers unique wildlife photo opportunities. 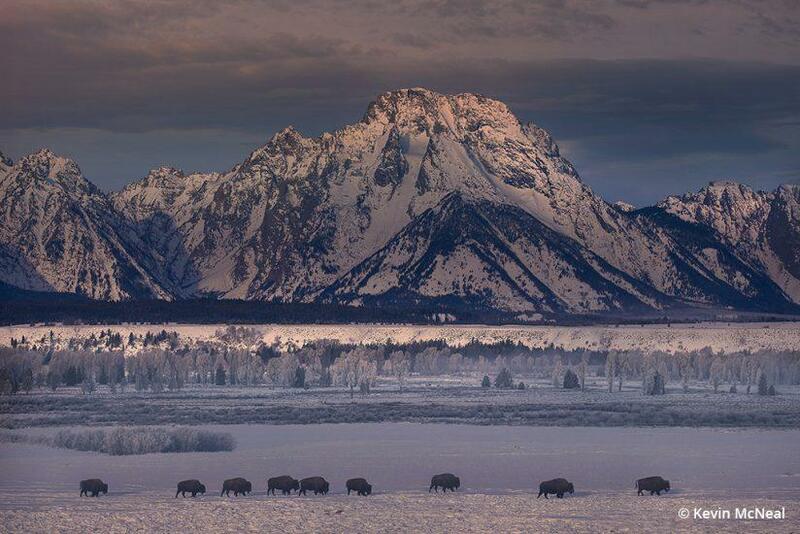 Here, a row of bison cross in front of Mt. Moran after a fresh morning of new snow in Grand Teton National Park. Mistakes are common when you are new to winter photography, and every individual will have different things that work for him or her. Success comes with perseverance, and learning from mistakes is the key. Experiment with different types of adventures, varying the length of time you’re in the field, your weight loads and locations. Take some early trips near home, and figure out what works for your style. These “starter” trips also give your body a chance to acclimatize to the colder conditions and build tolerance over time. Once you’re accustomed to the clothing, equipment and physical effort required, you’re ready to start making some great images. The main technical obstacle to winter photography is the challenge of exposure. When evaluating exposure, your camera meter might not provide accurate readings for white subjects like snow or ice. This error occurs because snow fools the camera meter into trying to average out the luminosity of the snow, and the camera ends up turning the snow gray rather than white. To get around this challenge, you must increase your exposure by one or two stops to retain the highlights. Bracketing with exposure compensation in one-stop increments beginning at an even exposure bias (0) and extending the exposure bias by plus/minus two stops at either end can help ensure that at least one of your exposures will be good. Another solution is to take a reading with your camera set to spot meter mode from a non-white subject, such as the trunk of a tree. 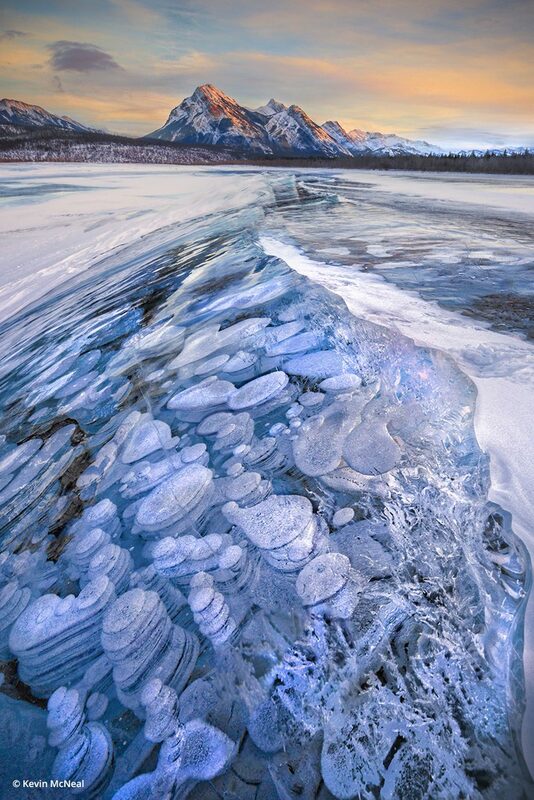 Abraham Lake in the Canadian Rockies is unique for the bubble-shaped circles that form just under the surface during very cold temperatures. A critical element in improving your winter photography is paying close attention to the light. In wintertime, the light quality is unique, as frequent changes in weather take place. These weather changes make the clouds susceptible to more movement; thus, there are more opportunities to capture the transient light. Transient light can be described as changing ambient light occurring when clouds interact with the sun’s luminosity. The diffused light at sunrise or sunset can lead to dramatic, colorful lighting that is accentuated by its contrast with the white snow. Sunrise and sunset light lasts longer in winter, allowing the opportunity for more extended periods of shooting. To capitalize on this opportunity, look for situations that will enable side lighting that pronounces a subject’s features. Light from the side not only enhances the contours and shapes of the main elements but also gives the image depth, which draws a viewer in and makes the photograph more interesting. To make the most of winter weather, track weather systems in your local area and be present when these weather changes occur for dramatic skies as a backdrop of your scene. Snow is a natural reflector of light, so incorporate subjects into your composition that will reflect color into the image. Elements that can add impact to compositions in winter situations include icicles, ice-rimmed and frosted subjects, and natural shapes outlined in the snow. 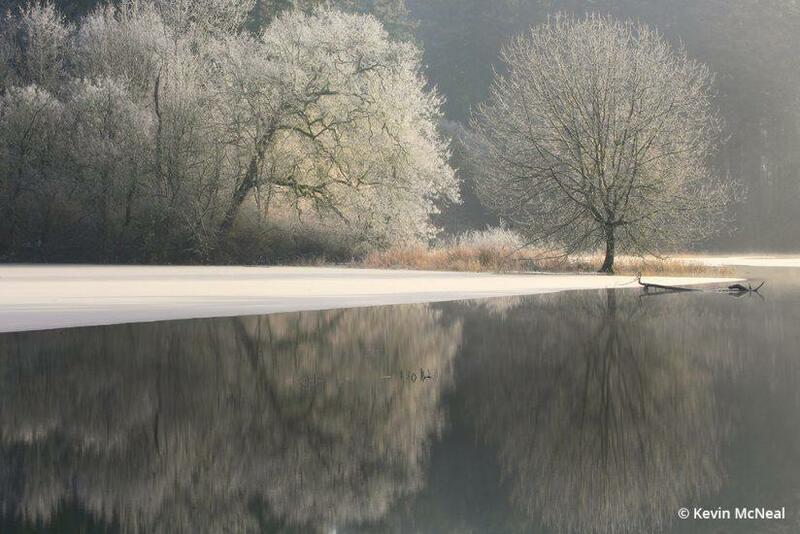 Warm reflections rise during an early winter morning in Olympia, Washington. Pre-visualizing your photograph—“seeing” the image you want to make beforehand and how your subject will react with the light—will help you plan and time your shoot and lead to more compelling images. Preparation is the unifying concept that ties all of these recommendations together. Success follows for those who are well-prepared and envision what they are trying to capture. Winter is a great opportunity to get out and try something new. Take the time to enjoy what you are doing, and you’ll come back with beautiful images. 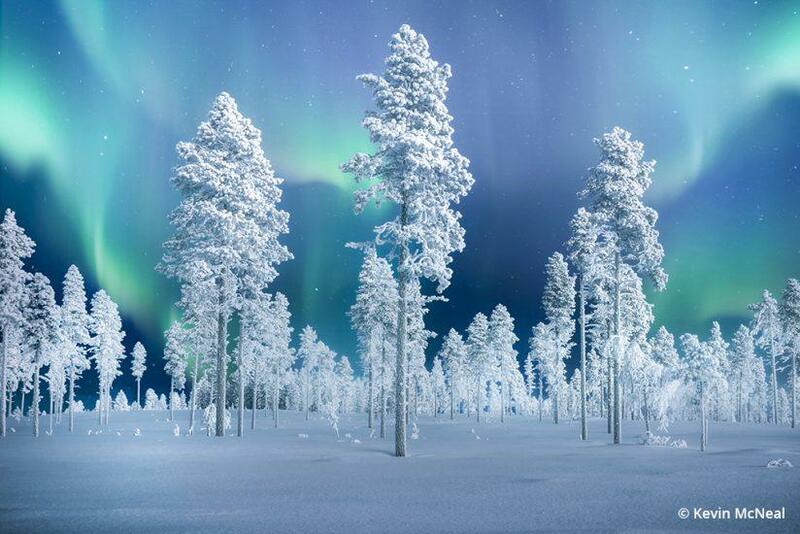 See more of Kevin McNeal’s work at . The post Get Ready For Winter Photography appeared first on Outdoor Photographer.